American Bulldogs are a purebred who do well with large lawns and spaces to roam about. In 2015, there were 602 American Bulldogs available for adoption. 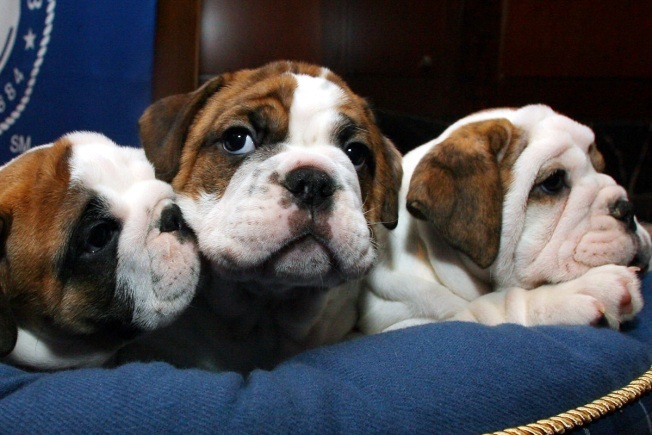 Massachusetts Attorney General Maura Healey is suing a Shrewsbury man for allegedly operating an unlicensed pet shop in his home from which he sold fatally ill bulldog puppies to unsuspecting buyers. The complaint, filed in Suffolk Superior Court, alleges that Heath Morse illegally sold puppies out of his home without abiding by state laws governing animal health or obtaining the required license to operate a pet shop. The attorney general's office says many of the bulldogs Morse sold to families suffered from serious diseases or in some cases died within hours of being purchased. The lawsuit alleges that Morse -- whose businesses included Heath’s Legendary Bulldogs, Dream-A-Bullz, Heath’s English Bulldogs, Heath’s French Bulldogs, and Heath’s Bulldogs -- falsely advertised on various websites and social media platforms that he was a longtime bulldog breeder and that the puppies he sold were healthy, of “show-dog quality,” American Kennel Club certified, pure bred, and veterinarian checked. But the attorney general's office said he routinely sold very sick dogs to customers for thousands of dollars, some of which required thousands of dollars of veterinary care or died within days. And while Morse advertised that the bulldog puppies were housed in "five-star" conditions, the attorney general's office alleges that he kept puppies infected with contagious diseases alongside healthy dogs in an outside fenced-in area which was covered in their own waste. State law requires animals suspected to be diseased to be quarantined from other animals. The attorney general's complaint seeks restitution for the victims, civil penalties and a permanent injunction preventing Morse from ever selling puppies or falsely advertising puppies again. It was not immediately clear if Morse had an attorney.